At a time when many citizens were confused about what synthetic drugs were, the Illinois Poison Center was often their first call for help. Unfortunately, as the President of the To the Maximus Foundation (TTM), I know the side effects of synthetic drugs all too well. 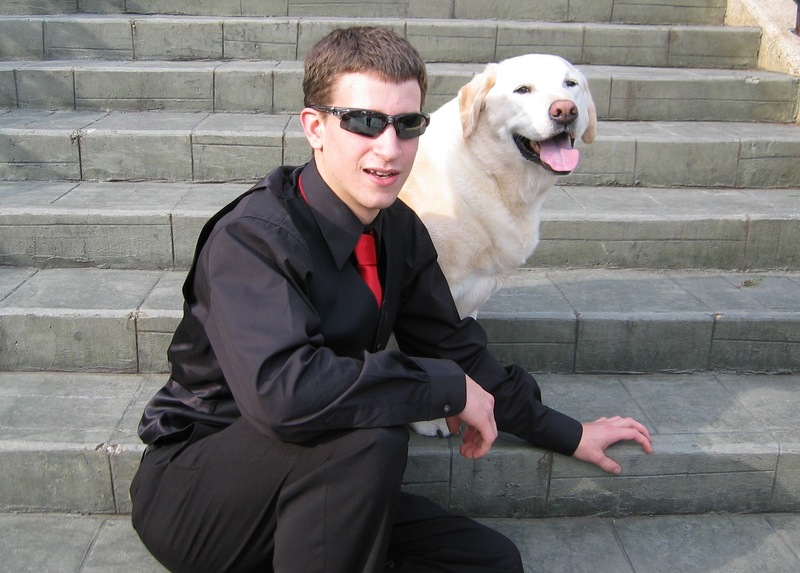 The foundation was founded after the death of my son, Max Dobner, during his first time use of synthetic marijuana (Spice). TTM educates and informs about synthetic drugs and advocates for effective legislation. Spice, a synthetic drug designed to mimic marijuana, cocaine and methamphetamine,, consists of plant material laced with chemicals, often classified as “poison” by legitimate laboratories on their Material Safety Data Sheets. Max had gone to the mall with a friend, where they were both talked into their drug purchases by the owner of a little concession shop in the mall. She encouraged the kids to buy her “special,” which were new flavors of her poison-laced products. After Max’s friend dropped him off at home, he called his brother saying,“I smoked that legal stuff and I’m freaking out. My heart is pounding real hard.” His brother advised him to take a shower and lay down, not having any idea how dangerous these products were. Half an hour later, Max jumped into his car and drove at speeds reported by 911 callers to be 80-100mph through town. Eventually, when a road came to an end, without even applying his brake, his car flew 80 feet through the air and landed in a house. Max died, almost on impact. Users often do not know which chemical they are ingesting, what the potency is and the many serious side effects associated with those chemicals. The effects of these designer drugs are extremely dangerous. As reported cases continued to grow in Illinois, my foundation worked with other organizations, including the Illinois Poison Center and the Illinois Office of the Attorney General, to help combat this epidemic. Illinois Attorney General Lisa Madigan led the charge in Illinois’ war against synthetic drug dealers and manufacturers. Her office developed a battle plan that involved several state agencies, including the IPC. Also, TTM started a massive media campaign to educate the public in August of 2011. 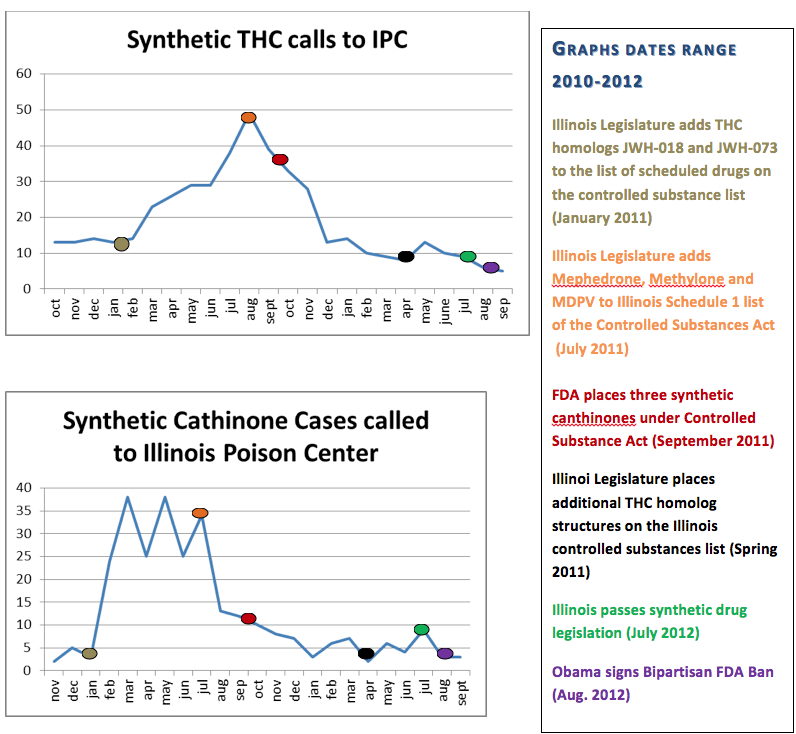 The number of calls due to synthetic drugs in Illinois has gone from 30% above to 60% below the national average. The collection of this data played a critical role in the efforts of law enforcement and legislators. 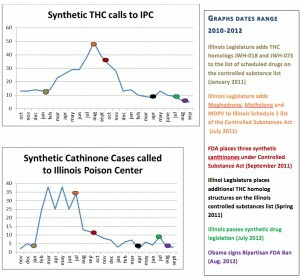 When most of the country was experiencing an increase in synthetic drug related Emergency Department (ED) and law enforcement incidences, Illinois was breathing a sigh of relief, as statistics continued to decrease. Without an early warning system and a plan for response, most states are experiencing epidemic cases of mental and physical injury to out most precious resources; our young citizens. Mental illnesses that result from synthetic drugs are very costly to treat. Althought many side effects of synthetic drugs are still unknown, we do know that there are individuals that have been suffering from mental illness for a prolonged period. The cost to the American public continues to rise, as these people are unable to care for themselves. The IPC continues to monitor incidences, report to law enforcement as cases arise and offers its citizens a number of services, the most important of which is to address the public safety challenges that involve poisons. TTM continues to speak to teens, young adults and parents about the dangers of these products. Synthetic drugs are a very serious threat to the public safety. The IPC has not only help protect us from that threat, but saved us countless resources that are used to counter the effects of these drugs. First, let me tell you that I am so sorry for your loss. I can’t imagine what you are going through having lost a child because of this poison. Sounds like the state of Illinois is doing a great job. The only problem is that when they ban one chemical, another is developed. Hopefully, they will be quicker to ban the chemicals as soon as one is detected. I think that would help law enforcement enforce the laws as well. Right now, they could confiscate some spice and it might not contain an illegal substance. They have to give it back in some instances. Your story really touched my heart and I admire what you are doing to try to help educate people about spice.